Pollination is necessary for plants to reproduce. The term “pollinator” means butterflies, hummingbirds, beetles, birds, bees, and other creatures that transport pollen. Bees have unfairly garnered a negative reputation. The truth is that most bees don’t sting, so you can safely watch them without fear, from a polite distance, while they go about their business of pollination. Just remember to avoid bees’ nests and remain calm, moving in a non-threatening manner. If you are If you’re allergic to bees, keep plants that attract bees in the back of your garden to allow pollination, yet a peaceful co-existence. 1. Avoid pesticides which also harms good insects. 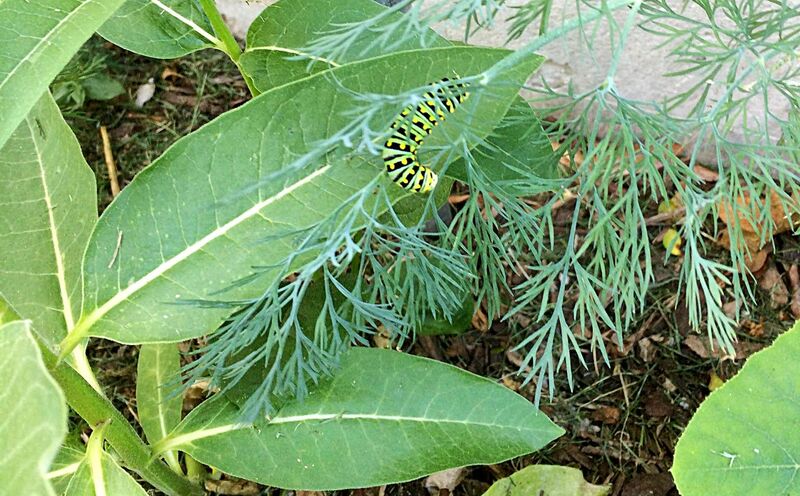 This hungry caterpillar recently photographed on a dill plant will one day become a swallowtail butterfly. 2. Plant native plants that have adapted with the local insects to provide an excellent ecosystem for pollinators. 3. Stagger the blooms in your garden to provide a nectar source from early spring through late fall. 4. Leave a few bare spots in your gardens and leave some leaves in the garden in the fall. Many native butterflies overwinter in your garden debris, and solitary bees, that are mostly harmless, will dig a nest in the ground to raise their young. An added bonus—decomposing leaves add nutrients back into your soil. 5. Increase your garden and reduce your lawn and plant in groups of the same flowers. More blooming flowers makes foraging easier! • Agastache comes in annual as well as perennial varieties. It works well in containers or in your garden. With an assortment of colors, this sun to part sun plant blooms all season and will attract hummingbirds and butterflies and is also deer and rabbit resistant. • Asclepias (Butterfly Weed) the annual version provides bright red and yellow flowers to your garden as well as nectar sources and food for monarch caterpillars. • Calibrachoa and petunias repeat bloom from spring until frost and provide a food source for butterflies and hummingbirds to bridge the gap between perennial bloom times. • Cleome has large spiky flowers that self-sow for next year! These flowers come in assorted colors and have a unique fragrance that attracts butterflies. • Cosmos attracts butterflies and birds. This no-fuss plant thrives in sun and poor soil and is an excellent cut flower. • Lantana can’t be beat for its color, scent, and trailing habit. It also attracts hummingbirds and butterflies! • Salvia is another plant that is available as an annual or a perennial. Both are pollinator plants. • Verbena provides long-lasting, breath-taking color to containers or gardens. It attracts butterflies. Verbena ‘Imagination’ also attracts birds. • Alliums unique globe-shaped flowers are sure to please visitors to your garden—whether they be humans or tiny pollinators. Allium can be planted as a fall bulb or is available in containers. • Calamintha 'Montrose White' has sprays of pure white flowers. It is deer and rabbit resistant yet is a magnet for bees, butterflies, and hummingbirds. We suggest you place this plant in a less-trafficked area to allow bees to have their space, but you are sure to enjoy the beauty and fragrance of this plant. • Nepeta (catmint) adds a fragrant splash of color to the garden over a long period of time. Hummingbirds, butterflies, and beneficial insects are attracted to their minty fragrant foliage and blooms. • Asclepias (or milkweed) is the only food source for the larvae of the monarch butterfly, but its clusters of nectar-rich flowers are attractive to all types of winged visitors. • Buddleia, referred to as the butterfly bush, is a deer and rabbit resistant plant that thrives in loose, humus-rich soil with good drainage. Its flowers and fragrance attract butterflies and hummingbirds. The Growing Places carries a variety of buddleia in a wide range of colors. • Liatris is a superb perennial for full sun or part shade. The multitudes of upright spikes make quite a statement in the garden and attract hummingbirds, butterflies, and bees. For a full list of pollinator plants and plenty of ideas, join us on June 17th at 1pm at The Growing Place in Aurora for the “Gardening for Birds, Butterflies, & Pollinators” class or stop in anytime. We are happy to help you create a Pollinator Paradise in your home landscape.